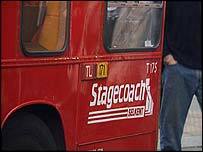 Transport group Stagecoach has agreed to sell its Hong Kong Citybus operation for £176m ($293m). The rail and bus operator has agreed terms with Delta Pearl for an unconditional sale, expected to be completed later this month. The sale comes six weeks after the group warned that the outbreak of Sars in the area was hitting the Hong Kong operation's profits. And on Friday, Stagecoach sold parts of its struggling USA coach business. Stagecoach said the Hong Kong sale was based on a long-term view rather than the immediate trading conditions and the impact of Sars. Stagecoach said a combination of uncertainty over the economic situation in Hong Kong and growing levels of regulation were among the factors behind the decision. It also said that with limited opportunities to develop its presence elsewhere in the Pacific Rim region, it would have to make "very significant" investment in order to grow profits. Delta Pearl is an indirect subsidiary of Chow Tai Fook Enterprises Ltd, the privately owned company of the Cheng Yu Tung family. Chow Tai Fook Enterprises Ltd is also a major shareholder in New World Development Company Ltd, which has an interest in New World First Bus Services Ltd, one of Hong Kong's major bus operators. Stagecoach sold Coach USA on Friday for $155m (£93m). Coach USA is the biggest charter and sightseeing coach company in the United States but it has been hit by a downturn in tourism. Stagecoach said the money raised from selling the west and south central regions of the business would be used to cut its debt. The company said it was still looking for buyers for its south east and Canada regions as well as its remaining taxi businesses.